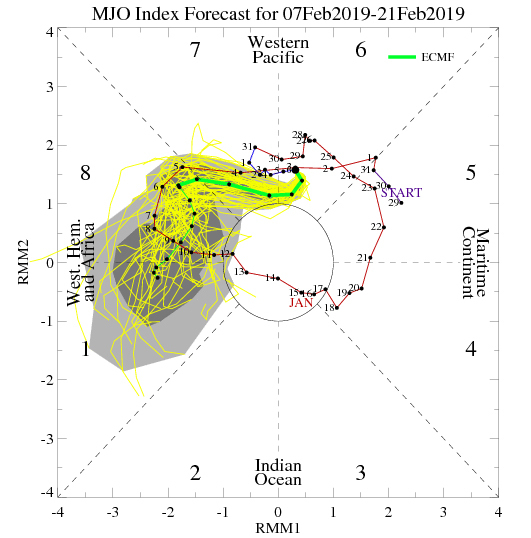 The European model’s forecast of the “Madden Julian Oscillation” (MJO) into late February, showing a pass through phases 8 and 1 after mid-month. One of the main drivers of the weather pattern during the winter months is clusters of thunderstorms across the tropics; these thunderstorms give off an incredible amount of heat and influence the position and intensity of the jet stream, which can impact both how active a pattern is and how warm/cold it is. A simplified index to measure where these thunderstorms are most prominent is the MJO; simply, a phase 8, 1, or 2 MJO in February is conducive for colder than average conditions over the eastern half of the country. We took a trip through the “less conducive” phases to end January, and not coincidentally we saw milder weather to start February. The thinking is the inverse will occur later in February. Our longer-range forecast models are picking up on hints of that pattern. The above image, from the GFS model ensemble, shows the developments of a -NAO or “Greenland Block” during late-February (all of the reds over the North Atlantic), a common ingredient for large Northeast and mid-Atlantic winter storms. In addition, a very active jet stream coming into the western U.S. (denoted by the blues) will bring numerous moisture-laden systems. Also note the area of blues over New England, indicative of potentially colder weather than normal. If this Greenland Block develops as anticipated, the ingredients will be there for potent west to east moving systems to bring snow across the Ohio Valley and Midwest, and then develop into coastal storms that can threaten the mid-Atlantic and Northeast with snow. We have not seen a pattern like this lock in for any length of time this winter; the closest was in November, which brought a surprisingly significant early-season winter storm to the East Coast and a significant winter storm to Chicago. 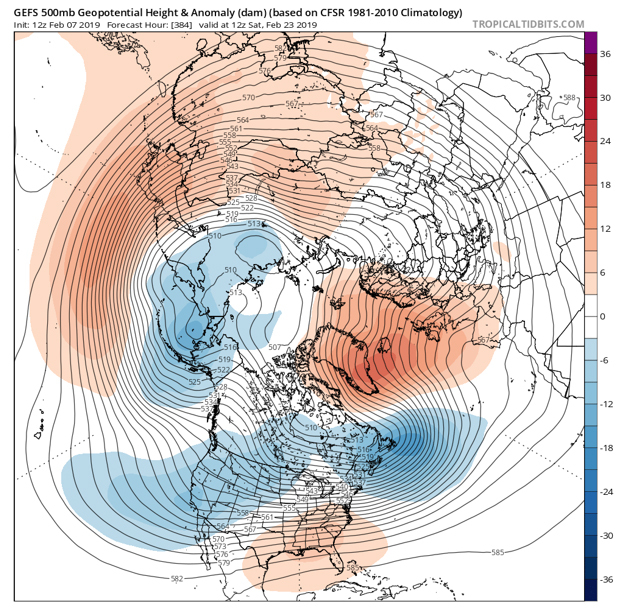 A Greenland Block was a large contributor to last March’s barrage of East Coast winter storms, with snowy conditions also lingering into Spring in the Midwest. 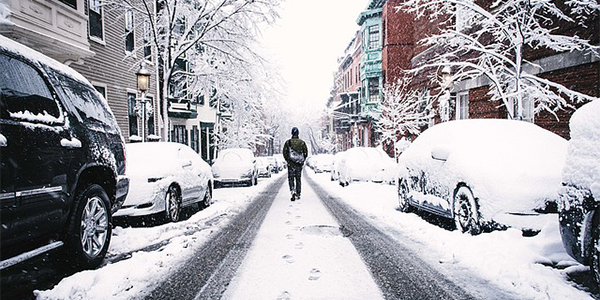 While nothing is a given when we’re talking about the weather pattern more than a few days out, there are certainly reasons for optimism if you’re not quite ready for winter to be over yet.